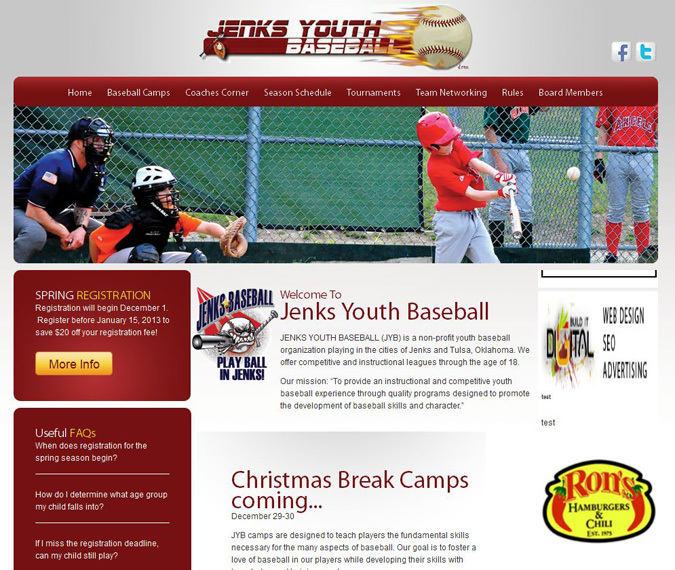 Jenks Baseball is a youth baseball organization operating out of Jenks, Oklahoma and Tulsa, Oklahoma. 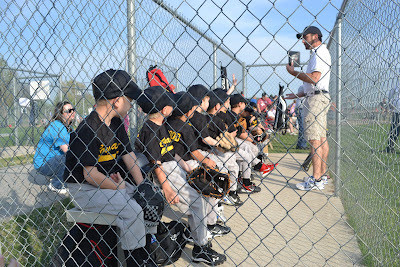 The league offers fall, summer and spring baseball leagues. In the spring league there are t-ball division for four to five year olds and then six year olds, which cost $110 per person. Coach pitch is for 7U and 8U and runs $130. Player pitch ($170) is for 9-14 year olds. Uniforms cost extra and are at the discretion of the team’s coach. The cut off date for each age group in April 30. Players can play up an age group (or two ages groups with special permission) but can never play down an age group. The minimum players required for a team is ten, and any roster with more than thirteen players needs special league approval. There are two levels of teams for each age group, competitive and instructional. Players have the option of trying out for the competitive team. If they are not selected they will be placed on an instructional team. Players also have the option of forming instructional teams with their friends. If these teams have less than ten players the league will fill out their rosters. The spring season runs between late March and early June. Games are played Monday through Friday at either Six PM or 7:45 PM. There are also games all day Saturday. Sunday is only for rain out makeups. For the 11 and up players Jenks Youth Baseball games are six innings and no inning can began after the game has hit its hour and a half time limit. (The younger kids play five innings.) There is a seven run limit in each inning. The run limit can be exceeded on a home run with players on base. Pitchers are only allowed to pitch eighteen outs per week. The extra outs in double or triple plays don’t count against this total. Starting pitchers can return to the game once after being replaced, however relief pitchers cannot return after being removed. Balks are enforced in age groups 11 and up. Stealing and leading off are allowed in this age groups as weel and the dropped third strike rule is in effect. There are no DH’s in Jenks Youth Baseball. Coaches can subsite defensive players freely within the inning. Bats for the kid’s pitch leagues can made of wood, metal or composite but can not exceed 36 inches or 2 ¾ inch diameter. Base runners are obligated to avoid contact with fielders if possible, and can not attempt to jump over them to avoid a tag. Players who violate this rule will be called out and possibly ejected. Fielders and base runners are forbidden from digging into the dirt with their cleats and will be ejected without warning if they do so. In addition to hosting youth baseball leagues at two locations, Jenks Youth Baseball offers baseball camps and private instruction. Mike Ponio, a former college pitcher at the University of Oklahoma, runs these camps and also works with the Jenks Baseball teams on their pitching mechanics and fundamentals.